The weekend is full of racing festivities, including NASCAR exhibition races and qualifying for the Indianapolis 500. 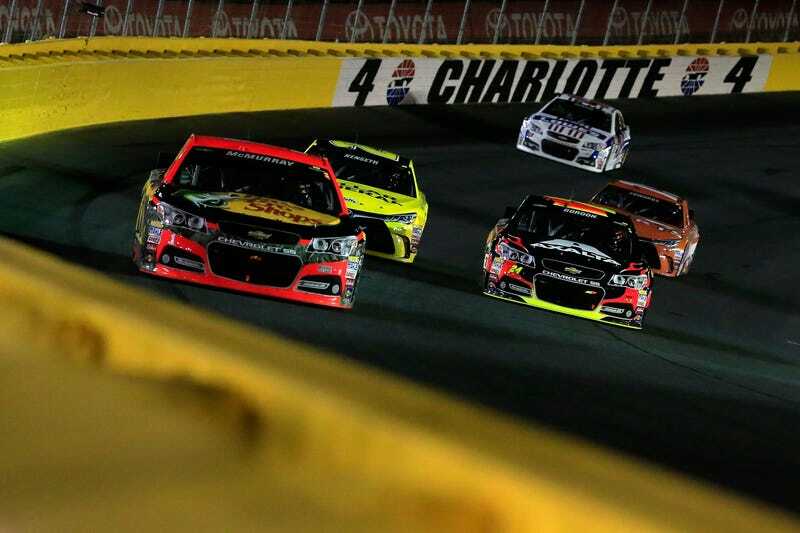 The NASCAR Sprint Cup Series will run its annual Sprint All-Star Race at Charlotte Motor Speedway on Saturday night, and it’s a no-points event with short segments and a prize of $1 million. The Friday events in Charlotte rained out, so the early Saturday replay times below will likely air other content. The schedule below has been updated for the postponed races and their new start times. Next weekend is the Verizon IndyCar Series’ big show, but qualifying will take place over the next two days for the 100th running of the Indianapolis 500 at Indianapolis Motor Speedway. Not everyone will be celebrating No. 100, though, as the entry list only reached 33 cars for the event. If every driver successfully makes it through qualifying, everyone will have a starting spot in the race. Red Bull Global Rallycross will start its season this weekend in Arizona, running a doubleheader event at Wild Horse Pass Motorsports Park. The series runs fast, short races—heats, semifinals and a main event—and will have 12 events this year. Scott Speed took the series title last year, and he’s back to defend it. In addition to those series on the live lineup, MotoGP will be in Italy, the FIA Formula E Championship will run in Berlin, the FIA World Rally Championship will rally through Portugal and NHRA will race in Kansas. On the tape-delayed side, you can catch FIM Motocross, Red Bull X Fighters, the Lucas Oil American Sprint Car Series, AMSOIL Arenacross, Dunlop MSA British Touring Car Championship, FIM X-Trial World Championship, DTM, Lucas Oil Off-Road Racing Series, Indy Lights, Formula DRIFT and the Red Bull Air Race. If you know of any other events or live streams going on this weekend, go ahead and let us know in the comments below.